Leslie Model 120C | MOSweb Online! In this case the “C” refers not to “Conn” but to the fact that this is the model 120 with a special dual scoop rotor intended for complex voices. Complex voices being defined as non Flute/Tibia tones such as Strings and Diapasons. 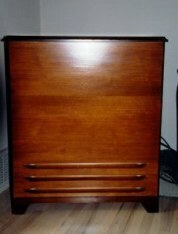 This model was made for use with almost any monaural organ, when connected via the appropriate connector kit, and it is usually teamed up with a model 120 for the Flute / Tibia voices.